Come catch the FFGR, Inc. spirit! Our group will be participating in Chick-fil-A’s Spirit Night. It’s an opportunity presented to us by Chick-fil-A to help non-profit organizations like ours earn money (and have fun in the process!). We will be at the Chick-fil-A (at 1005 Foxcroft Avenue) in Martinsburg, West Virginia, Saturday evening (August 20) from 5 p.m. to 8 p.m. During that time, anyone coming into the restaurant and presenting a coupon for our group when they eat will help us. Chick-fil-A will donate 20% of the proceeds to our group! The folks at Chick-fil-A have been really supportive and helpful. They gave us 500 leaflets with coupons to hand out. Ashley Lake, who has been in charge of this event, has been handing out hundreds to businesses in the Martinsburg area with great success! She has been on the go for weeks now! We have been handing out the leaflets at our meet and greet event as well. We have handed out almost all of the leaflets! 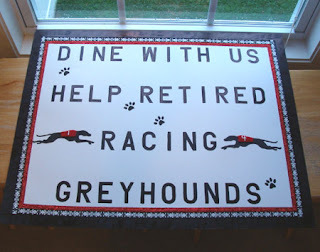 Our volunteers are also permitted to be at the restaurant and we are also permitted to have our greyhounds there! One of our volunteers will be wearing the Chick-fil-A cow costume and he will be waving at people as they come in to eat (and hopefully convincing people out on the street to come in as well!). We will be able to talk to customers about greyhound adoption if they approach our table. If you would like to come and help out our group but don’t have a coupon, please come and stop at our table. We will have extra coupons for those who request one. We will also have coupons available at our regularly scheduled meet and greet at the Martinsburg Petsmart. Stop in on Saturday, August 20, between the hours of 11:30 a.m. and 1:30 p.m. We hope to hand out many more coupons there as well. For more information, go to our web site Calendar of events. Come on by and catch the spirit! !